Area/description: Approximately 10 miles south of Crane Prairie Reservoir and about a forty-minute drive from Chemult from Highway 97. Species: Largemouth bass; Klamath strain rainbows and tui chub. Although the lake was once renown as a trophy trout lake, the illegal introduction of tui chubs and largemouth bass has forever altered this once famous fly fishing only lake. Although trout may still be caught, their numbers have greatly diminished. Stories abound of 14 to 16-inch rainbows lodged in the gullet of trophy size bass. Today Davis Lake is considered a trophy bass fishing lake, but for every good sized bass caught, be prepared to land a lot of 8 to 10-inch little hungry guys. Boating: Boating is restricted to 10 mph. Boat launches are primitive. The West Davis Lake Campground has the best launch; East Davis Lake Campground has a primitive spot for car-top boats; the Lava Flow Campground has a good hard-packed, shallow bottom, but during the summer you will have to drag your boat off your trailer and follow a narrow channel along the Lava flow to circumvent the tulles and weed growth. Fishing season: General Best times: April through early July on good water years provides the best fishing for bass and trout, but check with the local fly shops after a heavy snow pack year. During the spring the winds can be fierce by mid-day, and even during the summer there is no guarantee that the wind will settle down for the evening bite. Because the lake is so shallow and loses water due to the porous lava bed section, water temperatures do not cool until September when the fishing picks up again. Small bass may be taken easily throughout the summer using poppers in the evening and Rickard’s Seal Buggers in the morning. Tips: During spring start with large leech patterns and Zonker minnow patterns in olive green, but keep the retrieves slow. In May and June start with olive damsel fly nymphs. By June good morning hatches of both damselfly nymphs and dragon fly nymphs emerge and begin their migrations to shore. Anglers using kickboats do well probing the edges of the tulles and looking for recessed openings to present their offerings. Working Zonkers in the lava bed coves and along the shoreline can be very effective. 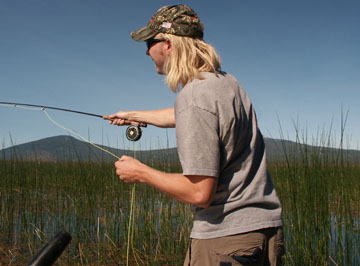 Most anglers work the eastern shoreline above and below the lava flows. If the wind picks up, look for passages and openings in the heavy tulles. Although the water rises and drops like the wake of a large boat passing by, my son and I found that the bass readily attacked poppers when we could get off the lake and find sanctuary in secluded opening in the tulles. Restrictions: Davis Lake is a fly fishing only lake requiring barbless hooks. Additional information: Having selected a favorite new five-weight rod, I would recommend using a six-weight rod. I would also recommend a floating line for poppers, and an intermediate full sinking line when you probe under the surface. Directions: From Highway 97 in Chemult, continue a few miles north to the Highway 58 route to Eugene. Continue west on Highway 58 to the signed route to Davis Lake. 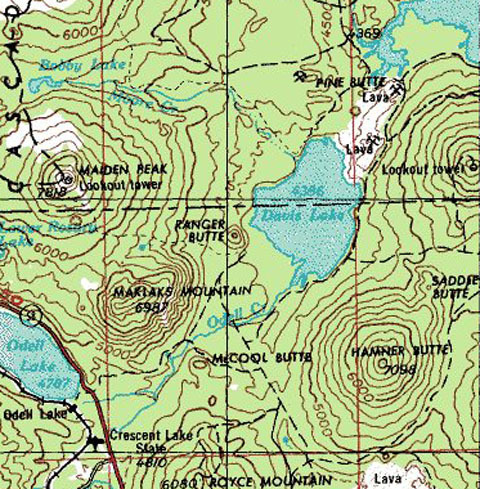 The lake may also be reached from the town of Crescent or by following the Century Drive Highway from Bend, which is a longer but scenic route taking you past many of the great Cascade lakes west of Bend. This page contains a single entry by David Archer published on August 16, 2008 1:21 PM. Bishop Canyon Campgrounds was the previous entry in this blog. Lone Pine Area Campgrounds and Fishing is the next entry in this blog.